These novel immune-based therapies allow for unique approaches to treatment, either as monotherapy, in combination with one another, or in combination with other treatment modalities, such as targeted therapy, electrochemotherapy, or surgery.1 The increasing number of treatment options now available in advanced melanoma has prompted a need to identify biomarkers that can be helpful in selecting patients for specific treatments. However, several challenges are associated with incorporating biomarker testing into the management of patients with metastatic melanoma and other cancers, and guidance in “what works best” is of interest to many oncology and pathology practices, both at academic centers and in community practice settings. To this end, development of best practices for incorporating molecular biomarker testing in the delivery of precision therapy to patients with metastatic melanoma was the focus of a conversation between Morganna Freeman, DO, Assistant Clinical Professor, Department of Medical Oncology, City of Hope Comprehensive Cancer Center, Duarte, CA, and Vishwas Parekh, MD, Assistant Clinical Professor, Department of Pathology, City of Hope Comprehensive Cancer Center. These 2 experts shared their perspectives on how they work together as part of the cancer care team to deliver individualized therapy to their patients. Because City of Hope is a mix of an academic center and a community hospital, many of the insights from Dr Freeman and Dr Parekh can be applied to both academic and community-based practices striving to meet the challenge of effectively incorporating biomarker testing into the precision treatment of patients with cancer. 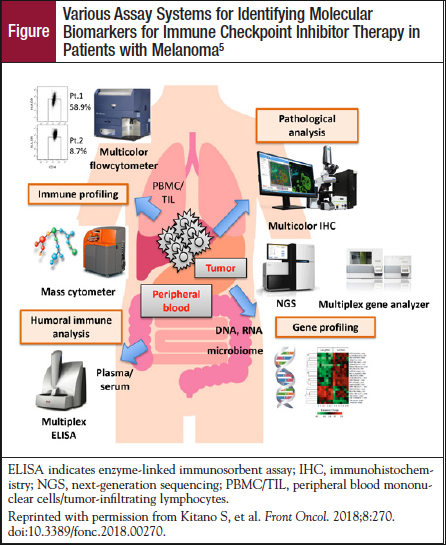 Multiple potential biomarkers for predicting response to immunotherapy may be needed given the complexity of the tumor microenvironment and its interaction with the immune system. To be of clinical value, biomarkers need to be accurate, reproducible, minimally invasive (depending on the clinical situation), and able to direct selection and sequencing of cost-effective therapy. Current biomarker candidates include PD-L1 expression, CD8+ tumor-infiltrating lymphocytes, tumor mutational burden (TMB), neoantigen burden, and gene-expression-profile (Table).1 Although these biomarkers have been shown to provide benefit in selecting optimal therapy, each is associated with significant challenges, including variability in assays, validation of scoring cutoff points, need for relatively large biopsy tissue samples, and slow turnaround time. These concerns are in addition to the challenges faced by medical oncologists and pathologists, as described by Dr Freeman and Dr Parekh. Payment and reimbursement for biomarker testing is an important issue in the current environment of cost-effective medicine. For example, a FoundationOne (Foundation Medicine) NGS panel costs nearly $6000.6 Who pays for that if the cost of the test is not covered by the payer? When asked about best practices in meeting these challenges, Dr Freeman noted, “One of the best practices I would share is if you are going to select an NGS partner, find a company that you trust and work with them consistently, whether that is external testing or an internal NGS platform. I think that ultimately everyone is going to end up moving to just that. There are a number of tests that are continuing to evolve from a prognostic standpoint. Doing NGS gives you not only the molecular characteristics but also the MSI and the TMB. I think one of the best practices is to find a platform that you like, that you trust, that is interpretable, and use that consistently. Dr Parekh agreed. “Selecting the right platform is very important. We are dealing with a small amount of tissue. Molecular biomarker testing in oncology has come of age. Numerous candidate biomarkers are currently the focus of research, most notably, TMB, tumor or immune cell expressions of PD-L1, and CD8+ T-cell infiltration into the tumor. In the future, bioinformatics technology may allow for the combination of several biomarkers to produce a predictive scoring system, depending on the type and stage of the cancer, the individual treatments, and the timing of the treatment intervention.5 Although there are challenges associated with incorporating biomarker testing into clinical practice (selecting the optimal testing platform and managing costs and reimbursement of the tests), biomarker-driven immunotherapy and targeted therapy have dramatically altered the therapeutic landscape of several cancers. Many of the best practices discussed in this newsletter are tumor-agnostic, so that they can be applied to biomarker testing (including NGS and other comprehensive genetic profiling) across multiple tumor types, including lung cancer, metastatic melanoma, breast cancer, and other solid tumors, as well as hematologic malignancies. Because molecular biomarker testing is increasingly being used to inform targeted therapy and immunotherapy in patients with cancer, these best practices are relevant for the entire cancer care team, including medical and surgical oncologists, pathologists, pulmonologists, interventional radiologists, oncology nurses, and other healthcare professionals involved in the care of these patients. Ascierto PA, Puzanov I, Agarwala SS, et al. Perspectives in melanoma: meeting report from the Melanoma Bridge (30 November–2 December, 2017, Naples, Italy). J Transl Med. 2018;16:207. doi:10.1186/s12967-018-1568-6. Hodi FS, O’Day SJ, McDermott DF, et al. Improved survival with ipilimumab in patients with metastatic melanoma. N Engl J Med. 2010;363:711-723. Chapman PB, Hauschild A, Robert C, et al. Improved survival with vemurafenib in melanoma with BRAF V600E mutation. N Engl J Med. 2011;364:2507-2516. Buder-Bakhaya K, Hassel JC. Biomarkers for clinical benefit of immune checkpoint inhibitor treatment–a review from the melanoma perspective and beyond. Front Immunol. 2018;9:1474. doi:10.3389/fimmu.2018.01474. Kitano S, Nakayama T, Yamashita M. Biomarkers for immune checkpoint inhibitors in melanoma. Front Oncol. 2018;8:270. doi:10.3389/fonc.2018.00270. Goldstein DA, Shaib WL, Flowers CR. Costs and effectiveness of genomic testing in the management of colorectal cancer. Oncology (Williston Park). 2015;29:175-183. There’s really only one way to identify how patients are coping with serious illness: by asking them, according to Thomas J. Smith, MD, FACP, Director of Palliative Medicine, Johns Hopkins Medical Institutions, Baltimore, MD. According to data from a preliminary phase 1b clinical trial, a novel approach using the investigational toll-like receptor 9 (TLR-9) agonist CMP-001 in combination with pembrolizumab may have the potential to reverse resistance to anti–PD-1 therapy.